Ohio, like many states, has a raging opioid drug epidemic and is now trying to hold the companies making the drugs accountable. Ohio Attorney General Mike DeWine has sued five opioid manufacturers, accusing the drug companies of engaging in fraudulent marketing of the drugs by minimizing the risks and inflating the benefits of prescription opioids. The state of New York settled a similar lawsuit against two opioid drug manufacturers last year. "We believe the evidence will also show that these companies got thousands and thousands of Ohioans -- our friends, our family members, our co-workers, our kids -- addicted to opioid pain medications, which has all too often led to use of the cheaper alternatives of heroin and synthetic opioids," DeWine said. DeWine said the drugmakers routinely misinformed doctors, leading them to believe the drugs are not addictive, or that if patients became dependent, it was easy to get them off the drugs. "They knew they were wrong, but they did it anyway -- and they continue to do it," DeWine said. "Despite all evidence to the contrary about the addictive nature of these pain medications, they are doing precious little to take responsibility for their actions and to tell the public the truth." 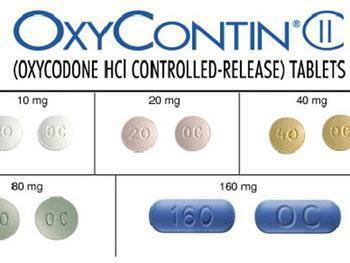 The suit names Purdue Pharma, which sold OxyContin, MS Contin, Dilaudid, Butrans, Hyslingla, and Targiniq; Endo Health Solutions, which sold Percocet, Percodan, Opana, and Zydone; Teva Pharmaceutical and its subsidiary Cephalon, which sold Actiq and Fentora; Johnson & Johnson and its subsidiary Janssen Pharmaceuticals, which sold Duragesic and Nucynta; and Allergan, which sold Kadian, Norco, and several generic opioids. The complaint alleges the companies violated the Ohio Consumer Sales Practices Act, which bars false and deceptive marketing. It points to what it says are medical journal advertising, sales representative statements, and the use of front groups to convince doctors that opioids offered their patients strong and effective relief from pain. It blames the alleged activity for what it says is Ohio's current opioid epidemic. The suit asks the court to declare that the companies' actions regarding the marketing and distribution of opioid drugs were illegal and seeks unspecified damages, including restitution to consumers. The U.S. Department of Health and Human Services (HSS) classifies opioid overdose deaths as the leading cause of injury death in the U.S. Although most people take prescription medications responsibly, HHS estimates 52 million people have used prescription drugs for nonmedical reasons at least once in their lifetimes. Most medical authorities say doctors share part of the blame, routinely prescribing opioids for conditions that could be treated by less addictive means.